This machine is available with a choice of a disc or cylindrical scrubbing system. Designed and built from the ground up, the result is a robust ride on scrubber dryer, offering powerful performance and maximum productivity to create the best looking floors. An advanced design to hold large-capacity batteries means the 7300 ride on scrubber dryer provides hours of cleaning productivity. With a coverage rate ranging from 4700 to over 5980 square metres per hour, a cleaning width of 1020mm, and a sizeable 216 litre solution tank, the 7300 ride on scrubber dryer will efficiently clean manufacturing plants, any warehouse, airports and retail facilities. The standard ES recycling system, with auto-fill extends scrubbing time by up to 360%. The 7300 ride on scrubber dryer offers unmatched productivity for machines in its class. 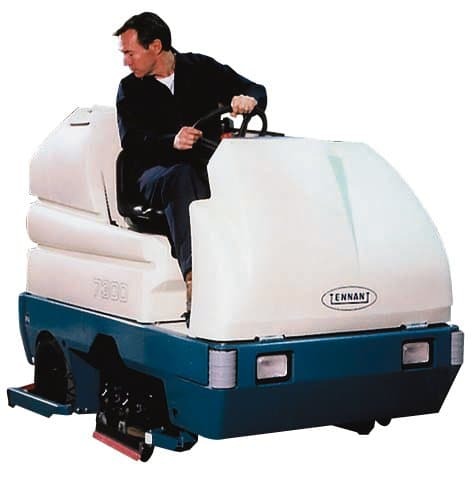 Customising the 7300 ride on scrubber dryer with two scrub-heads-disc or cylindrical, with a cleaning path of 1000mm – makes it unique on the market, fitting the most complex cleaning environments. The 7300’s ergonomically designed driver’s compartment meets the most demanding expectations. Spacious legroom, an adjustable seat, and tilt steering insure operator comfort. One-button scrubbing, on board diagnostics and a LCD system all contribute to easy operation. Brush, squeegee and filter changes can be made without tools, making maintenance quick and easy, ensuring productivity is pushed to the maximum. Put years of experience, along with the most advanced scrubbing technology, on your cleaning team with the 7300 ride on scrubber dryer. You will realise high productivity, low maintenance, and best of all – great-looking floors.